Catching horses for today’s ride was the first order of business this morning. 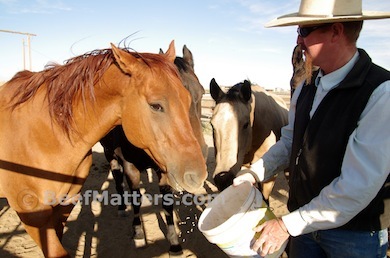 With a halter and grain bucket in hand we set off for the horse pen. 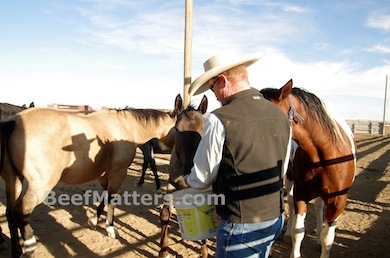 Today was Tinker’s turn to be pressed into service, but everybody wanted a nibble of grain. 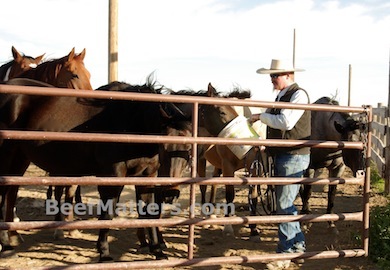 Some days it takes us longer to get out of the horse pen with our horse in tow than it does to saddle our horse and get to work! I love it when the younger horses come up and ask for a bite of grain. 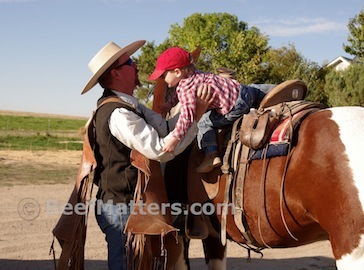 We always take a minute to scratch them on the nose and remind them that us cowboys aren’t too scary. Here comes Romeo for his fair share. Romeo has been on the injured reserve list for a couple of weeks. He is quickly recovering from an abscess on his shoulder. He should be back to work soon. 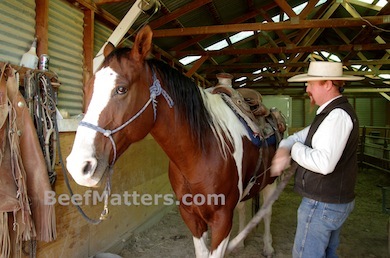 Once we got Tinker back to the barn, my husband spent a few minutes brushing Tinker and then saddled him up. 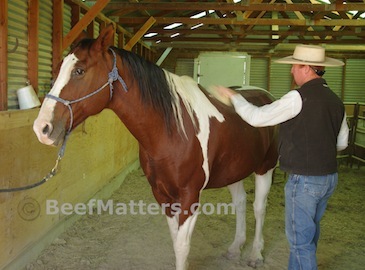 Being the stellar (and mature) horse that he is, stood there patiently through the whole process. He had no idea that all of this work was for one little boy who desperately wanted to go cowboying with his Dad. 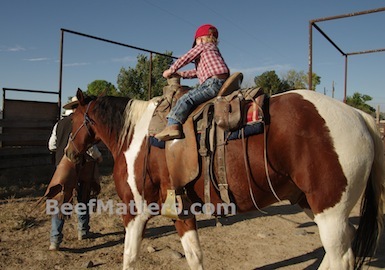 My littlest cowboy rode Tinker all the way from the horse barn, through the corral, to the horse trailer. I was thrilled that this brief ride qualified as cowboying for him today. When it comes to my three-year old I will take any success I can get!